This is a free listing of DCA Member litter ads. Listings are active for 8 weeks. If you are a DCA MEMBER and would like to list your litter please REGISTER to create your account or LOGIN if you already have an account. Welcome to the Dalmatian Club of America Breeder Referral litter listings. We want to help you be successful in finding the right puppy for you and your family. Learn all you can about our breed from our website and take the time to locate a reputable breeder from whom you will feel comfortable purchasing a puppy. The Dalmatian Club of America provides this Dalmatian breeder referral list to help you locate a good breeder who may have a litter of pups available. 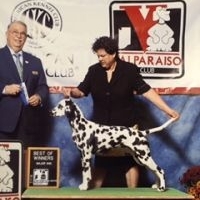 All breeders listed are Dalmatian Club of America members who have signed an agreement to abide by the conditions of the Code of Ethics for our organization. The DCA feels that breeding healthy dogs is imperative, and that health testing of parents is the best way to produce healthy offspring. The CHIC program was created by the Orthopedic Foundation for Animals to help breed clubs to register health tested breeding dogs. The CHIC litter postings (if both parents have been health tested) have a separate category, and those litters are highlighted in a blue background, have the CHIC logo in their ad and are featured at the top of the litter listings on the main page. DISCLAIMER: The Dalmatian Club of America accepts no responsibility for puppies/dogs that are purchased as a result of contact through our breeder referral program. The DCA will not be held responsible for any conflict that may occur, and by use of this list you expressly agree that you release the DCA from any and all claims and waive any and all damages, liability and expense. By using this service you acknowledge that you have read, understand and accept the statements above, accept the limitations and conditions set out above and release the DCA, its officers, agents or representatives of any claims arising out of use of this web site. Both Black and Liver spotted puppies are expected. Will have hearing tested and first puppy vaccination and worming. Sparkle's first litter resulted in 3 AKC champions. Puppies for companionship, breed showing and dog sports. If you have questions or need help you may contact our Breeder Referral Chair, Linda McSherry by email at patchmountaindals@gmail.com. Our Regional Breeder Referral volunteers are also happy to provide you with information about purchasing a Dalmatian puppy and answer any of your questions.